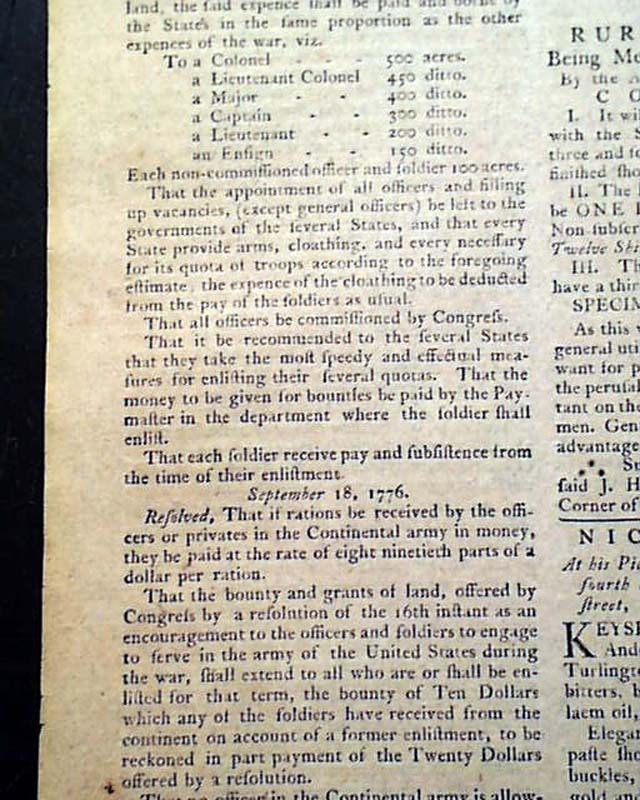 The front page has an ad for the desertion of two soldiers from military service, with details (see). 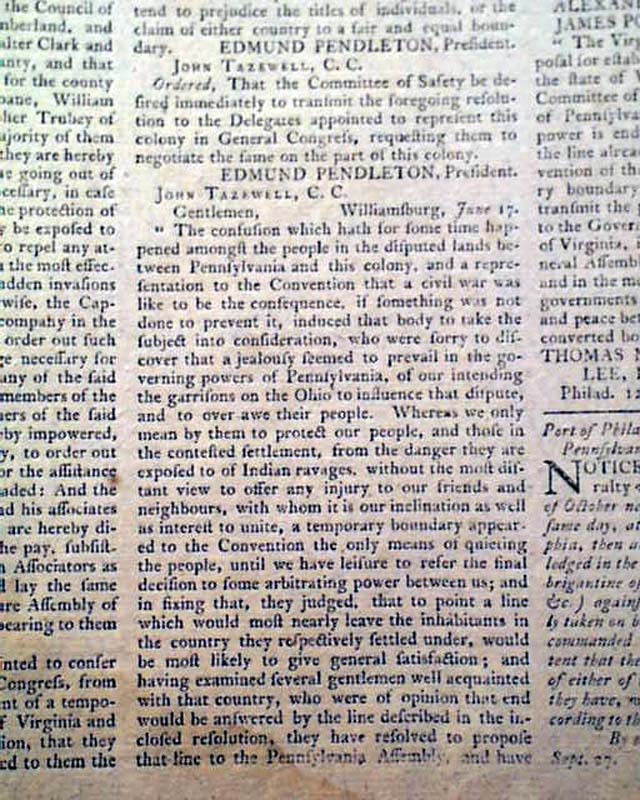 Page 2 begins with a report noting: "General Lee writes from Purrysburg...that he is going to break up East Florida. 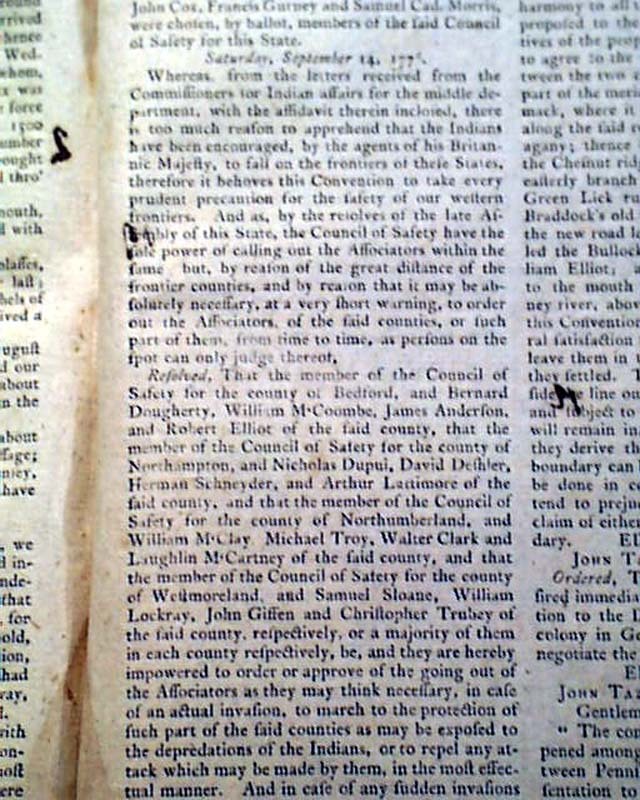 President Rutledge...writes that the South Carolinians had destroyed five Indian towns...". 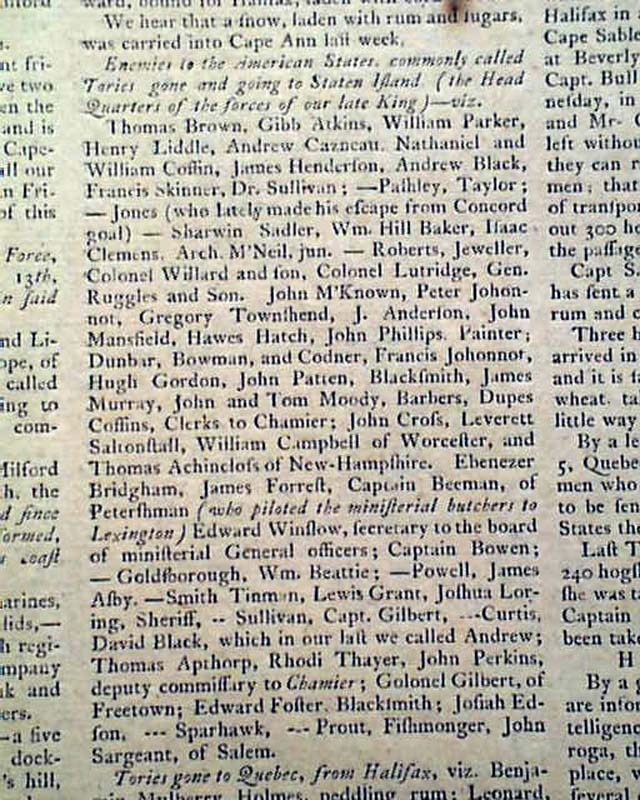 Also a list of: "Enemies to the American States, commonly called Tories, gone & going to Staten Island (the headquarters of the forces of our late King) followed by a lengthy list of names (see). 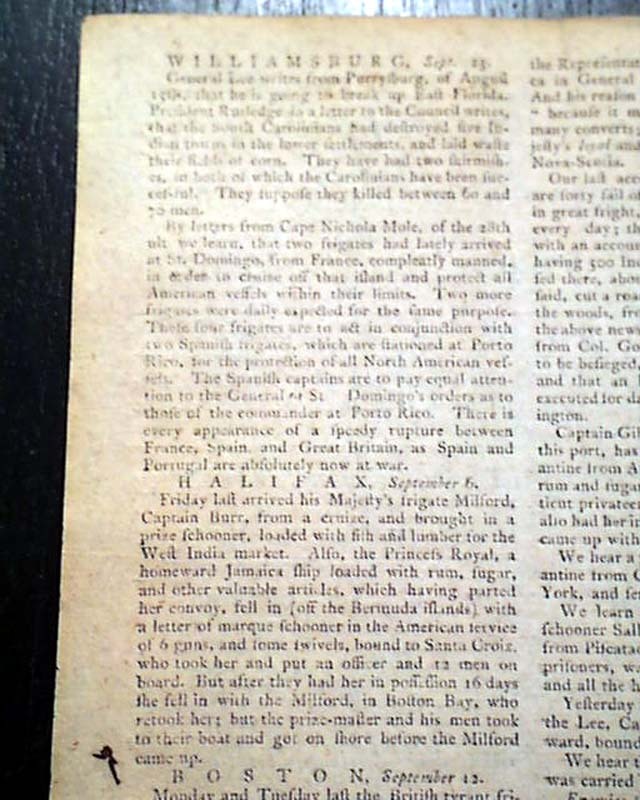 Another item notes: "...a letter from Gen. Thompson...Quebec harbour...appears that he & our men who have been so long in captivity, were about to be sent to General Howe to be landed in the States they belong to." 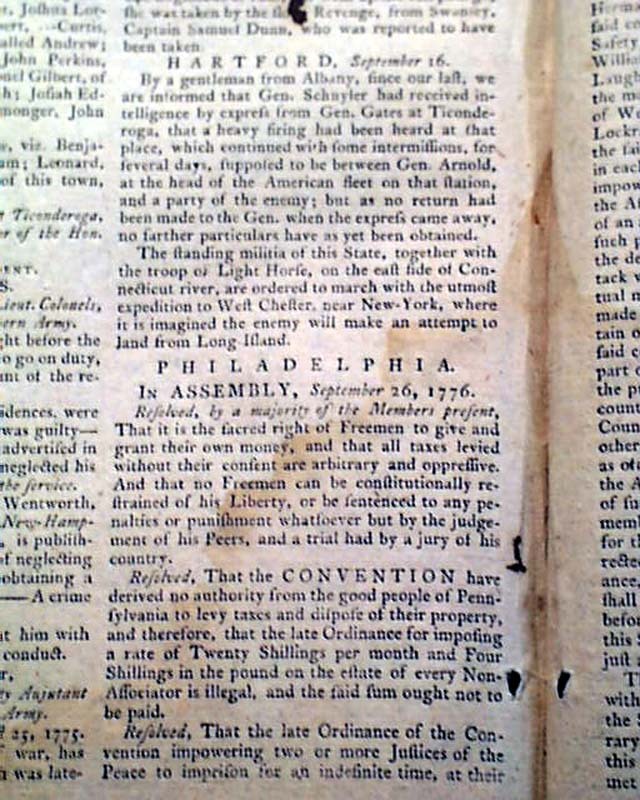 and another item: "...from Albany...informed that Gen. Schuyler had received intelligence...from Gen. Gates at Ticonderoga that a heavy firing had been heard...continued with some intermissions for several days, supposed to be between Gen. Arnold at the head of the American fleet...& a party of the enemy...ordered to march with the utmost expedition to West Chester, near New York, where it is imagined the enemy will make an attempt to land from Long Island." 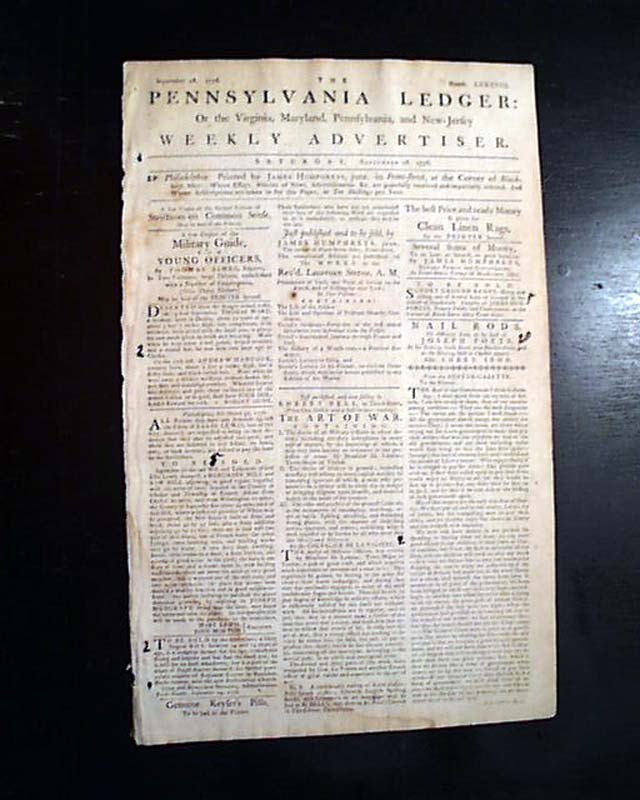 Page 3 has much concerning the protection of the western frontier and trouble with the Indians. 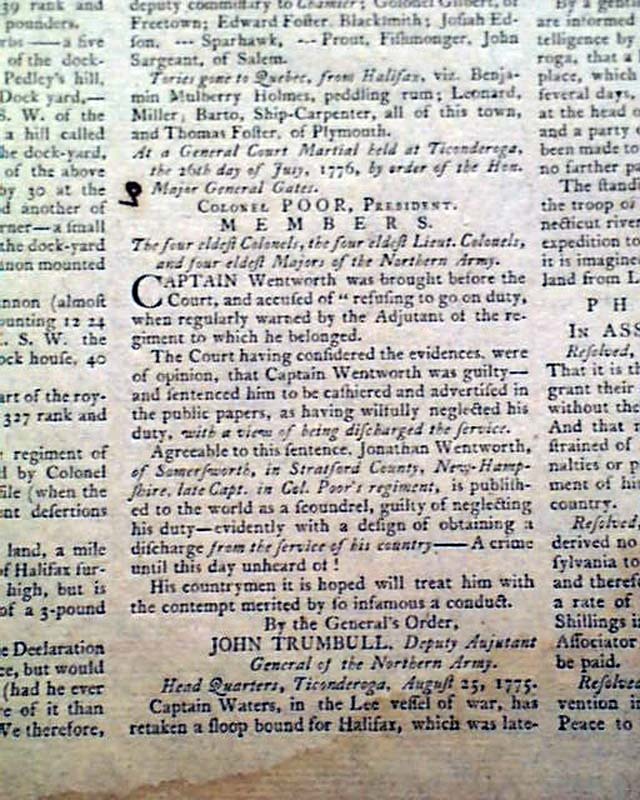 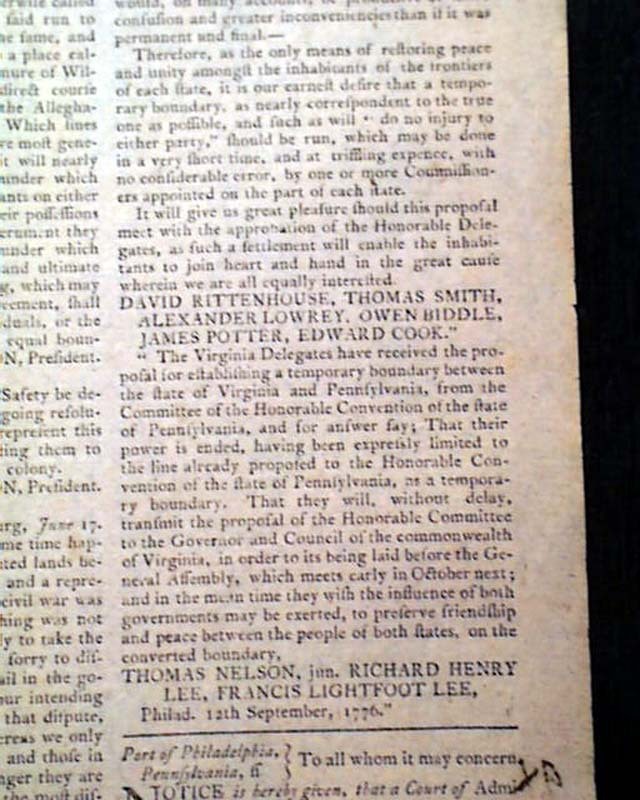 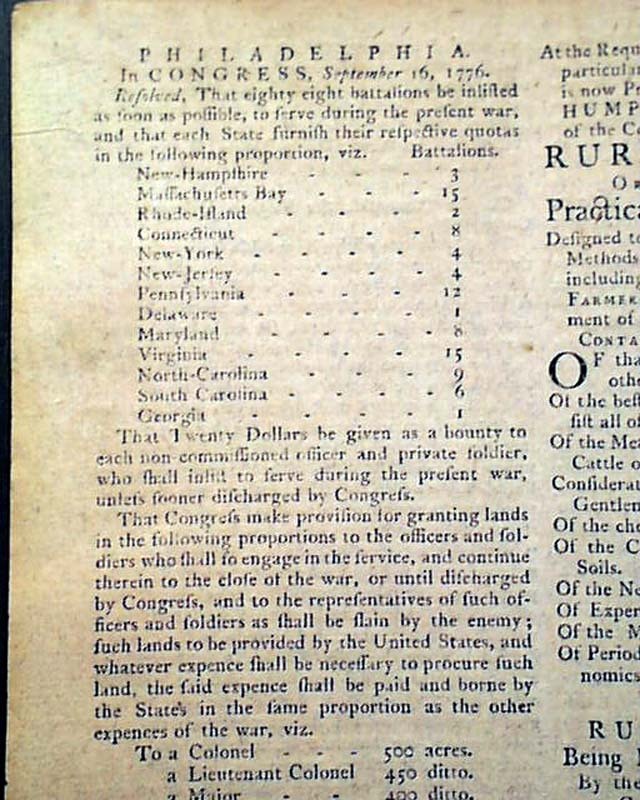 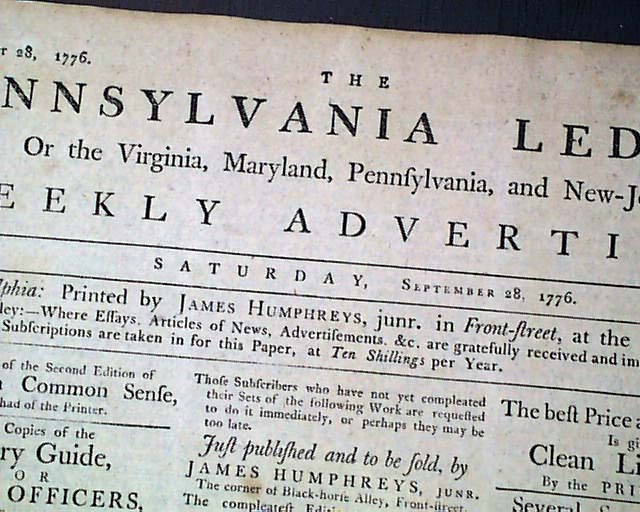 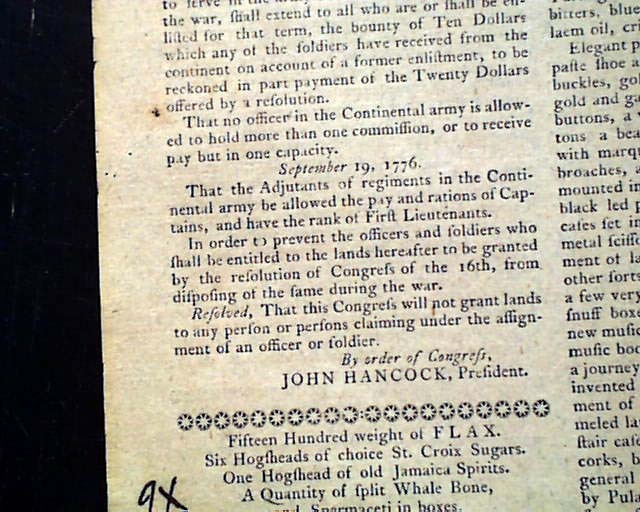 The back page has most of a column taken up with the number of battalions each colony is required to enlist (see) followed by the various bounties offered to officers for serving in the military (see). 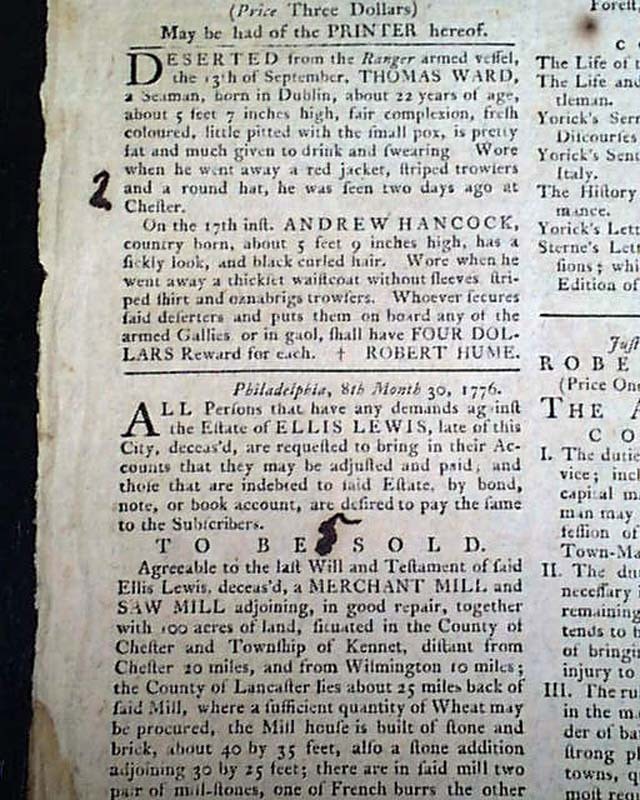 Four pages, light damp stain to a lower corner, numeric notations next to ads (this was the editor's copy), very nice condition.